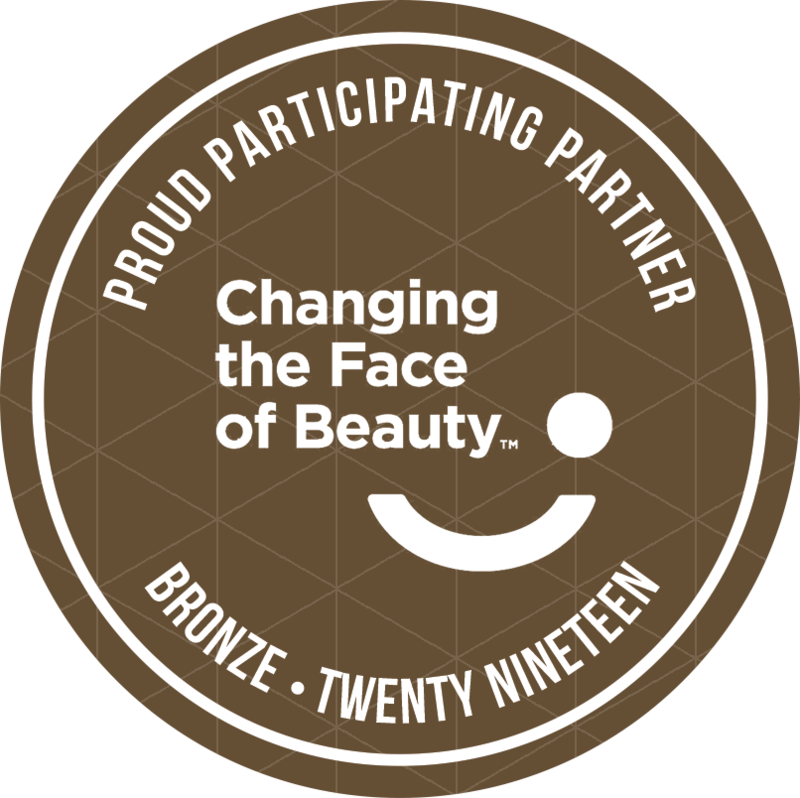 With a donation of $1K, you will be in the third tier of support of Changing the Face of Beauty for 12 months. Your name will be proudly displayed on the Changing the Face of Beauty website. You will also receive limited posts on our social media pages. Additionally, you will be awarded a “Bronze Partner” badge to display on your website and print material for up to a year. To continue with the partnership application process, please fill out the form below. Once we receive your payment and completed application, we will contact you with more information about this partnership. Thank you and we look forward to a successful partnership! You agree that you will not make any representation or do any act which may be taken to indicate that you have any right, title or interest in or to the ownership or use of the Marks except as licensed under the terms of this Agreement, and acknowledge that nothing contained in this Agreement shall give you any continuing right, title or interest in or to the Marks. You agree not to contest the validity of the Company's rights, or perform any act or omission adverse to, the Marks or to said exclusive rights, and agree that any and all use of the Marks hereunder shall inure to the benefit of the Company. All rights not specifically granted and licensed to you hereunder are hereby reserved by the Company. You agree to use the Marks in conformity with standards, policies, philosophies and missions of the Company and only in the form and manner as established or modified by the Company from time to time. Your use of the Marks hereunder shall be of high standard and shall in no manner reflect adversely upon the good will of the Company or the Marks. You shall not use the Marks in any manner which may be interpreted as libelous, immoral, obscene, or criminal, or which infringes, otherwise violates, or advocates the infringement or other violation of, any third party rights. You will cause to appear on all of your Media bearing the Mark appropriate statutory notice of registration of the mark. You agree to cooperate with the Company in facilitating the Company’s control of your use of the Marks, to permit reasonable inspection of your operations, and to supply the Company with specimens of use of the Marks upon request. You shall not misrepresent your relationship with the Company or present false or misleading impressions about the Company or misuse or bring into disrepute the name and character of the Company. You shall not use the Marks in a manner that implies or suggests that the Company approves or endorses your company or your goods and services except as the Company may have agreed separately with you in writing. You agree that the Company shall have no responsibility or liability for any content appearing on your Media or for your use of the Marks pursuant to this Agreement. You shall comply with all applicable laws and regulations and obtain all appropriate government approvals pertaining to your use of the Marks under this Agreement. You shall not use the Marks other than as permitted hereunder and, in particular, shall not incorporate the Company's name or Marks in your business name in any manner whatsoever. You shall not use or authorize the use, either during or after the term of this Agreement, of any configuration, trademark, trade name, or other designation confusingly or substantially similar to the Company's name or the Marks or any element thereof. You agree to promptly notify the Company of any unauthorized use of the Marks by others as it comes to your attention. The Company shall have the sole right and discretion to bring infringement or unfair competition proceedings involving the Marks. (ii) at any time by the Company in its sole discretion upon written notice to you. In the event that your rights under this Agreement are terminated for any reason, you shall thereafter immediately take steps to permanently cease all uses of the Marks, such steps to include destroying or eliminating all uses of the Marks that may still exist except as otherwise agreed in writing by the Company. You shall thereafter at no future time adopt or use any asset or component part of the Marks or any colorable likeness or imitation thereof or any variation or equivalent thereto without the prior written consent of the Company. Nothing herein contained shall be construed as creating a partnership or joint venture between the parties. You shall indemnify, hold harmless and defend the Company, and the Company's parents, subsidiaries, affiliates, officers, directors, representatives, employees and agents, from and against any and all claims, liabilities, demands, causes of action, judgments, settlements and expenses (including, but not limited to, reasonable attorneys' fees and court costs) arising out of or in connection with any breach of any representation, warranty, or covenant made by you hereunder or your failure to perform any of your covenants or obligations contained in this Agreement. You recognize that your breach of this Agreement would result in irreparable damage to the Company that could not be remedied adequately by monetary damages. As a result, you agree that if you breach this Agreement, or in the event of apparent danger of such breach, the Company shall be entitled, in addition to any other legal or equitable remedies available to the Company, to an injunction to restrain the violation of any and all such portions of this Agreement by you. In addition, and without limiting the foregoing, you agree that if you breach this Agreement, in addition to other legal and equitable relief, the Company shall be entitled to, and you shall pay to the Company liquidated damages in the amount of $10,000.00. This provision is not intended as a penalty, but to provide a means of assessing losses associated with goodwill in the event of a breach of this Agreement by you. The invalidity or partial invalidity of any portion of this Agreement shall not invalidate the remainder thereof, and said remainder shall remain in full force and effect. You agree that in addition to any other legal or equitable relief, the Company shall be entitled to an award of its reasonable attorney’s fees and costs in the event it becomes necessary for it to enforce its rights in any way under this Agreement. Exclusive jurisdiction and venue over any and all disputes between the parties hereto arising under this Agreement shall be in, and for such purpose each party hereunder hereby submits to the jurisdiction of, the state and federal courts serving Cook County, Illinois.